In California And Nevada, A Brief Respite Between Powerful Storms : The Two-Way A major storm just left the region early Monday; another is due to sweep through starting Tuesday. Emergency crews have taken this chance to rescue people stranded by the first storm. 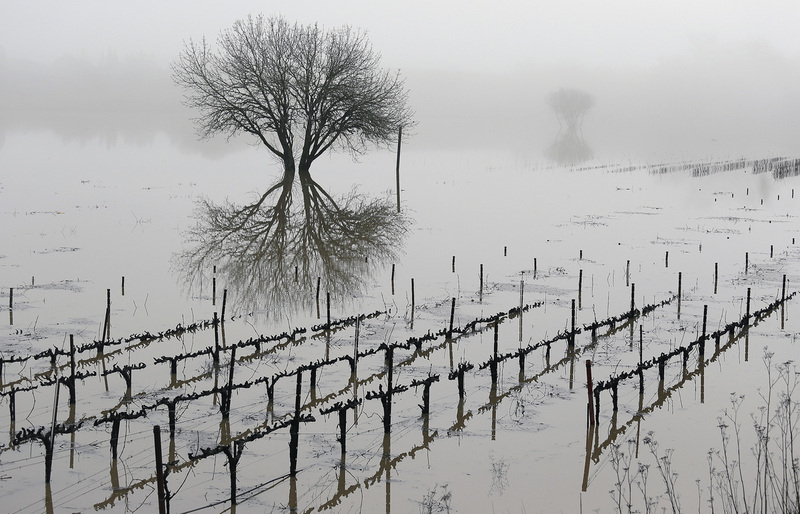 Vineyards remain flooded in the Russian River Valley in Forestville, Calif., on Monday. A massive storm system stretching from California into Nevada saw rivers overflowing their banks, flooded vineyards and forced people to evacuate their homes after warnings that hillsides previously parched by wildfires could give way to mudslides. Over the weekend and into Monday morning, a powerful storm in Nevada and Northern California resulted in mudslides and flooding, caused more than a thousand people to evacuate their homes, took out power lines and brought down a famous sequoia "tunnel tree." That storm is over, but residents can't relax yet: Starting on Tuesday, a second potent winter storm is expected to hit the region. Emergency workers are taking advantage of the "one-day respite from the rains," as The Associated Press puts it, to rescue people stranded by the storm and assess the extent of the damage. Capital Public Radio in Sacramento reported that some places in the Sierra Nevada received more than a foot of rain over the three-day storm that ended Monday. A long stretch of Interstate 80 was closed after a 60-foot mudslide, the radio station reports. The weekend was relatively warm, The Los Angeles Times reports, which means some of the snow dropped by the storm melted quickly and contributed to floodwaters. Flooding was extensive, with some roads remaining closed on Monday. Placer County tweeted video of a big rig overturned on a road covered with standing water, and urged drivers not to disregard signs marking roads as closed. KQED reports minor flooding "all over the [San Francisco] Bay Area," with mudslides and fallen trees closing highways and major roads, and nearly half a million people losing power. California's wine country was badly hit, The Associated Press reports; the Russian River in Sonoma County rose to its highest level in a decade, leaving vineyards submerged "with just the tips of vines visible in completely flooded fields," the wire service reports. At least one person was killed in the storm, the AP writes: A woman was struck by a falling tree as she walked on a golf course on Saturday. Emergency crews have used boats and helicopters to rescue people stranded by floodwaters, according to the AP. They have a narrow window of time before the second storm hits the area on Tuesday. It has "the potential for more heavy rain over the already very thoroughly soaked North Bay counties," KQED reports. Capital Public Radio also warns of high winds, with gusts up to 50 miles an hour in the Sacramento Valley. This storm is expected to be colder, too, bringing more snow that will stick around instead of melting. The National Weather Service used an exclamation point in its official prediction for snow totals in the Tahoe area, above 7,000 feet elevation: "5-10 feet!" The forecast also calls for 150 mph winds on ridge tops. 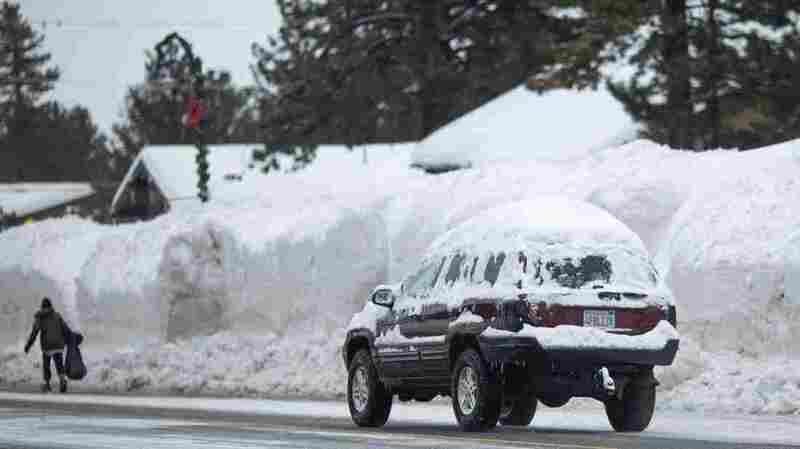 Snow piles continue to grow in Mammoth Lakes, Calif., on Monday, as a series of strong storms moves through the western U.S. The National Weather Service warns of "dangerous and potentially life threatening blizzard conditions" possible in the Sierra Nevada. "Strong winds will produce zero visibility in whiteout conditions along with high drifting snow," the weather forecast office in Reno says. "Even a short walk could be deadly if you become disoriented. Avalanche danger will remain high." Widespread flooding and perilous blizzard conditions have authorities urging people to hunker down, stay safe and avoid travel. But there's a silver lining to these clouds. California has been suffering through a lengthy, devastating drought. Two storms, no matter how intense, aren't enough to undo years of persistent drought — but the LA Times reports that if the wet weather continues, "2017 could prove a turning point for the epic dry spell."